"Dr. Hyman, an expert's expert on healing, shares his secrets to harvesting your body's potential for weight loss. Reading this compelling book is the next best thing to entering a cutting-edge health program." "At long last, a clear and practical book by an internationally recognized clinician who creates a sound diet as the cornerstone of a healthy lifestyle. There are no gimmicks, quick fixes, or misleading before and after photos since this diet is based on the latest science which underlies all effective weight management. If you are going to read and use only one book on diet and lifestyle, this is the one!" "Dr Hyman has worked at the interface of science, Western medicine and alternative health for over 20 years. 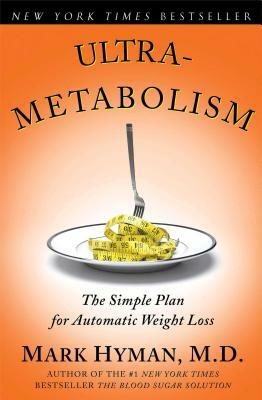 In Ultrametabolism, he distills this experience into a provocative prescription for weight loss. I have no doubt that this book will make an important difference in the lives of many Americans seeking optimal health." "Combining cutting edge science and clinical wisdom, Mark Hyman provides a clear, carefully individualized, blueprint for weight loss and good health. It is, quite simply, the best book I've seen on the subject." "Congratulations to Dr. Hyman for another masterpiece. This is the most comprehensive explanation of the underlying causes of weight gain I have seen." "Ultrametabolism is a gem. Scientific, practical, and user friendly, it gives you everything you need to know for creating a lean, healthy body." "UltraMetabolism delivers on its title with a real program that has been developed by one of America's leading nutrition and preventive medicine doctors who also knows how to communicate his successes in writing. The book is both educational and inspiring, and coaches the reader through an effective program for "tuning up metabolism" and improving functional health. This book will be the catalyst for many people accomplishing their goal of good health." -- Jeffrey S. Bland, Ph.D., President and Chief Science Officer, Metagenics, Inc.
"Finally, a program that makes weight loss a part of your healthy lifestyle. Dr. Hyman's UltraMetabolism isn't a diet, it's a way of life. If you want to lose weight and reduce factors that lead to certain diseases, buy this book." "A healthy lifestyle holds the key to maintaining optimal health as we age. Dr. Hyman provides some sensible signposts for those ready to embrace healthy living, and lower their risk of developing cardiovascular and other chronic diseases."